Linen Chest is surprising us with an interesting offer: you can now save 25% off any single item bought in a Linen Chest store. Just download this coupon (PDF)to your smartphone or print the coupon out and present the coupon to obtain your 25% discount. 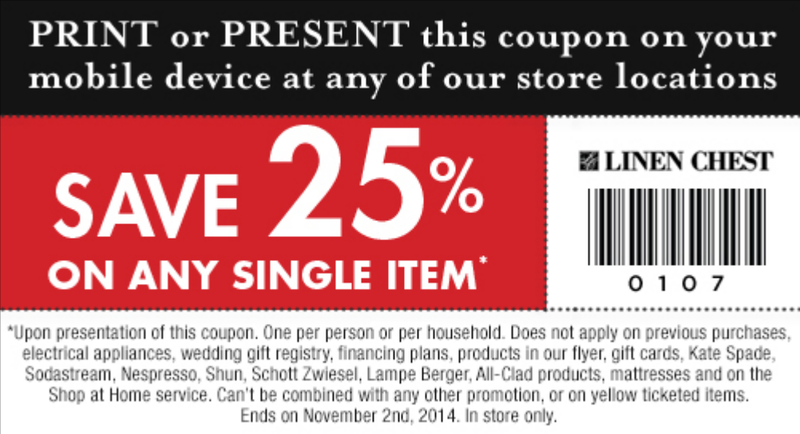 You can also download or print this image of the coupon. The offer is valid through November 2, 2014. Use it before then! In addition, you can also benefit from this offer (expensive a bit, though!). For every purchase of $500 on window coverings, Linen Chest will give you a free Linen Chest gift card. You can get a consultation by contacting the brand here.